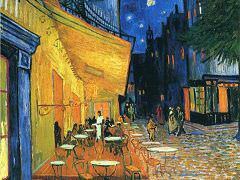 Widely hailed as Van Gogh's magnum opus, the painting depicts the view outside his sanatorium room window at night, although it was painted from memory during the day. Starry Night depicts a dreamy interpretation of the artist's asylum room's sweeping view of Saint-Rémy-de-Provence. Though Van Gogh revisited this scene in his work on several occasions, "Starry Night" is the only nocturnal study of the view. Thus, in addition to descriptions evident in the myriad of letters he wrote to his brother, Theo, it offers a rare nighttime glimpse into what the artist saw while in isolation. "Through the iron-barred window I can make out a square of wheat in an enclosure," he wrote in May of 1889, "above which in the morning I see the sun rise in its glory." 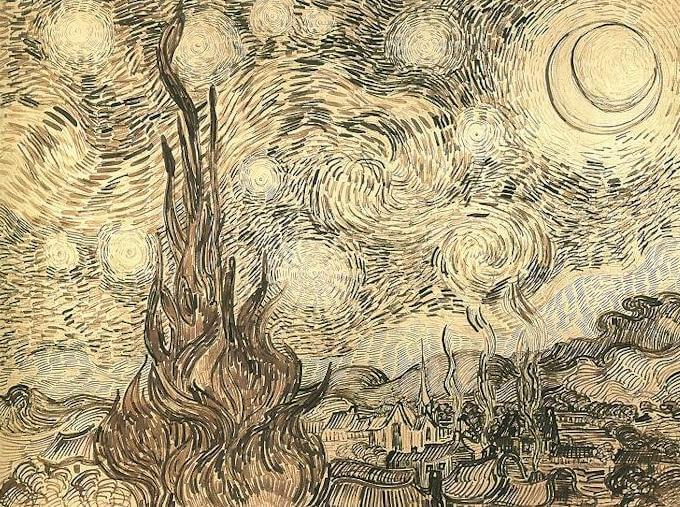 An end-of-the-world cataclysm invades Van Gogh's Starry Night, one of apocalypse filled with melting aerolites and comets adrift. One has the impression that the artist has expelled his inner conflict onto a canvas. Everything here is brewed in a huge cosmic fusion. The sole exception is the village in the foreground with its architectural elements. Several months after painting Starry Night, Van Gogh wrote: "Why, I say to myself, should the spots of light in the firmament be less accessible to us than the black spots on the map of France?... Just as we take the train to go to Tarascon or Rouen, we take death to go to a star." The artist is looking down on a village from an imaginary viewpoint. 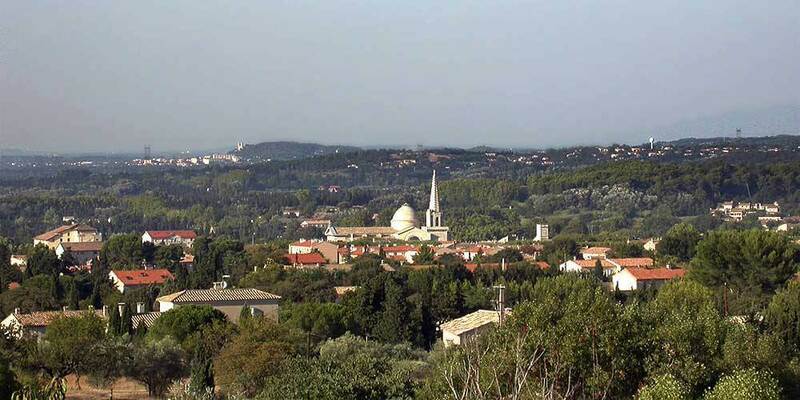 It is framed by his newly-discovered motifs: at left a cypress towers skywards, at right a group of olive trees cluster into the cloud, and against the horizon run the undulating waves of the Alpilles. Van Gogh's treatment of his motifs prompts associations with fire, mist and the sea,and the elemental power of the natural scene combines with the intangible cosmic drama of the stars. The eternal natural universe cradles the human settlement idyllically, yet also surrounds it menacingly. The village itself might be anywhere, Saint-Remy or Nuenen recalled in a nocturnal mood. The church spire seems to be stretching up into the elements, at once an antenna and a lightning conductor, like some kind of provincial Eiffel Tower (the fascination of which was never far from van Gogh's nocturnes). Van Gogh's mountains and trees (particularly the cypresses) had hardly been discovered but they seemed to crackle with an electric charge. 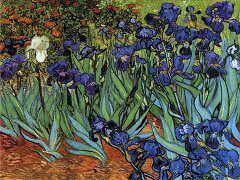 Confident that he had grasped their natural appearance, van Gogh set out to remake their image in the service of the symbolic. Together with the firmament, these landscape features are singing the praises of Creation in this painting. "I have done another landscape with olive trees, and a new study of the 'starry sky'", was van Gogh's way of describing the painting in his letter the Theo. "Although I have not seen the new pictures by Gauguin and Bernard, I am fairly certain that these two studies are similarly conceived. When you see them some time [...] I shall be able to give you a better idea of the things Gauguin, Bernard and I often used to talk about and occupy ourselves with than I can do in words; it is not a return to Romanticism or to religious ideas, no. But via Delacroix one can express more of Nature and the country, by means of colour and an individual drawing style, than might appear." Van Gogh is making various points here. First, his synthesis of motifs was his first echo of work with Gauguin since his breakdown. The nighttime scene (this is something that had only just become important to van Gogh) offers the visual imagination its most distinctive, unique field of activity, since the lack of light requires the compensatory use of visual memory. Van Gogh used the memory method in his nocturnal scene; his discovery of the luminous power of darkness was a personal aesthetic discovery and needed no Gauguin as catalyst. Second, van Gogh was drawing upon his long-lost model Delacroix again, and the principle of contrast; once he paused to reflect on what he had achieved in recent weeks he found his attention drawn back to the colourist techniques which he himself had developed so far. Third, he was searching for the essence of the landscape, its very being - a way of registering its symbolic power, its vitality, its flux and constancy, all in one. Interpretations of this painting are legion. Some claim it is a perfectly realistic account of the position of the stars in June 1889. This, needless to say, is perfectly possible. But the twisting, spiralling lines have nothing to do with the Northern Lights or the Milky Way or some spiral nebula or other. Others say that van Gogh was expressing a personal Gethsemane; they back this up by referring to the discussion of Christ on the Mount of Olives that he was currently engaged in, in his correspondence with Gauguin and Bernard. This too may be so; it is possible that premonitions of sufferings to come are articulated in the picture. But Biblical allegory is present throughout van Gogh's oeuvre, and he had no need of a special motif, least of all a starry sky, with all its associations of Arles and Utopian visions. Rather, van Gogh was trying to summarize; and his resume juxtaposed natural, scientific, philosophical and personal elements. Starry Night is an attempt to express a state of shock, and the cypresses, olive trees and mountains had acted as van Gogh's catalyst. More intensely, perhaps, than ever before, van Gogh was interested in the material actuality of his motifs as much as in their symbolic dimensions. There had been hills in Arles too, of course. But they entered his panoramic scenes as idyllic touches. His landscapes included the harvest, passing trains, isolated farmsteads and distant towns; and the hills were simply one more detail. In Arles, van Gogh's dream had been of the harmony of things and of the spatial dimensions in which that harmony could be felt. None of that remained. The hills rose up steep and abruptly now, menacing, threatening to drag the lonesome soul down into vertiginous depths. 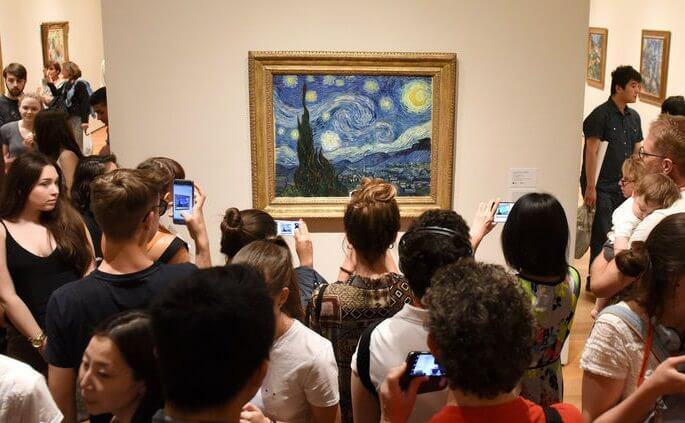 Starry Night has risen to the peak of artistic achievements. Although Van Gogh sold only one painting in his whole life, "Starry Night" is an icon of modern art, the Mona Lisa for our time. As Leonardo da Vinci evoked a Renaissance ideal of serenity and self-control, Van Gogh defined how we see our own age - wracked with solitude and uncertainty. 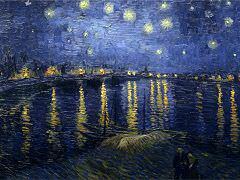 Since 1941 Starry Night has been in the permanent collection of the Museum of Modern Art in New York City. 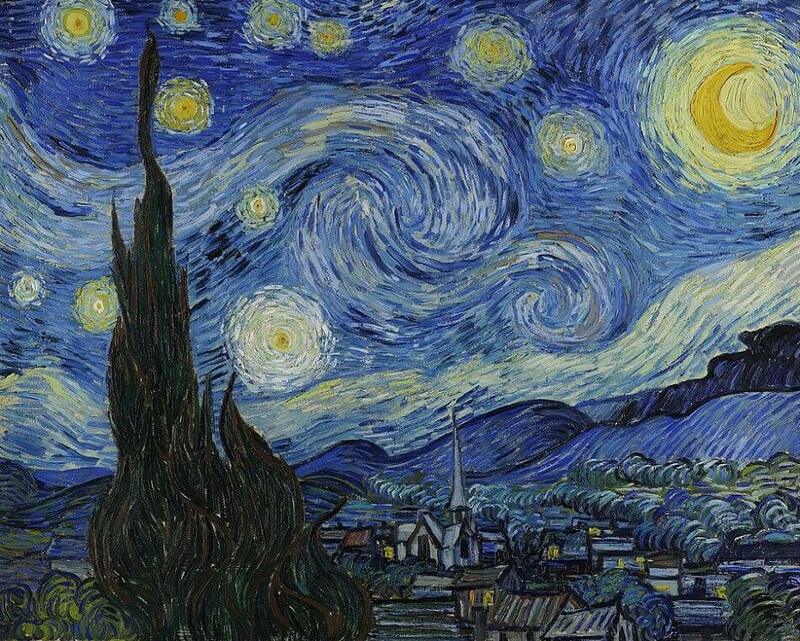 10 Facts that You Don't Know About "The Starry Night"
1) Vincent Van Gogh painted "Starry Night" in 1889 from a room in the mental asylum at Saint-Remy where was recovering from mental illness and his ear amputation. 2) Van Gogh painted the view from his east-facing window in the asylum 21 times. Although the series depicts various times of day and night and different weather conditions, all the works include the line of rolling hills in the distance. None show the bars on the window of his room. 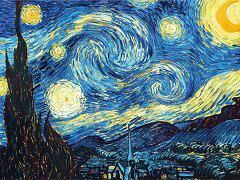 3) The artist considered "The Starry Night," which one day would rank among his most famous works, to be a failure, according to what he wrote to his brother. 4) Physicist Jose Luis Aragon compared the turbulent play of light and dark in such works as "Starry Night" to the mathematical expression of turbulence in such natural occurrences as as whirlpools and air streams. He found they matched very closely. 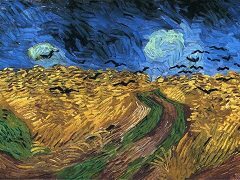 Two other Van Gogh paintings from 1890, WheatField with Crows and Road with Cypress and Star also feature this mathematical parallel. 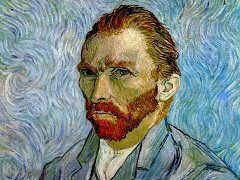 Aragon suggests that since the artist created these particular artworks during periods of extreme mental agitation, Van Gogh was uniquely able to accurately communication that agitation using precise gradations of luminescence. 5) Analysts of "Starry Night" emphasize the symbolism of the stylized cypress tree in the foreground, linking it to death and Van Gogh's eventual suicide. However, the cypress also represents immortality. 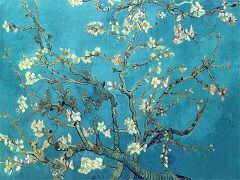 In the painting, the tree reaches into the sky, serving as a direct connection between the earth and the heavens. The artist may have been making more of a hopeful statement than many credit him with. This positive interpretation of the cypress symbolism hearkens back to a letter to his brother in which the artist likened death to a train that travels to the stars. 6) In his 2015 book, "Cosmographics," Michael Benson contends that the inspiration behind the distinctive swirls in the sky of Van Gogh's "Starry Night" is an 1845 drawing by astronomer William Parsons, Earl of Rosse, of the Whirlpool Galaxy. 7) Research has confirmed that the dominant morning star in the painting is actually Venus, which was in a similar position at the time Van Gogh was working on "Starry Night," and it would have shone brightly, just as Van Gogh painted it. 8) The moon in the painting would not have been in the crescent phase as shown at the time Van Gogh painted "Starry Night." In reality, it would have been gibbous, or about three-quarters full. 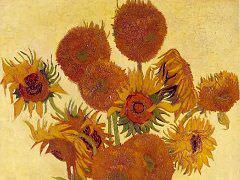 9) Pathologist Paul Wolf postulated in 2001 that the artist's fondness for yellow in paintings like "Starry Night" resulted from taking too much digitalis, a treatment in his day for epilepsy. 10) The painting resonates with art fans and the general public to the present day due in part to its vibrant palette and to the swirling motion that seems to draw viewers right into the center of the artist's fantastical vision.